In less than five weeks, Emil will be getting on stage at GraphConnect 2018 in the heart to Times Square, NYC and announcing the new release of….wow, I think we’re getting a little ahead of ourselves, aren’t we? Let’s refocus: You know you’re going to attend GraphConnect, but you haven’t bought your tickets yet. No time like the present, right? …but which Neo4j training should you sign up for? There’s like thirteen to choose from (more than ever before). It’s time to make that decision a little easier. Luckily for you, we’ve put together an awesome, six-question quiz to make your choice clear. Click below to get started! No quiz is perfect, but we hope you’ve found the droids…err, the Neo4j training…that you’re looking for. Click here to take the quiz again or tweet me with your angry comments! This year, we’ve changed up our entire training selection with mostly half-day courses, allowing you to take two training classes in one day (in most cases). No matter what Neo4j training you choose, we wish you the best of luck during your training session and we hope you enjoy all of the great speakers (among other reasons) at GraphConnect 2018! 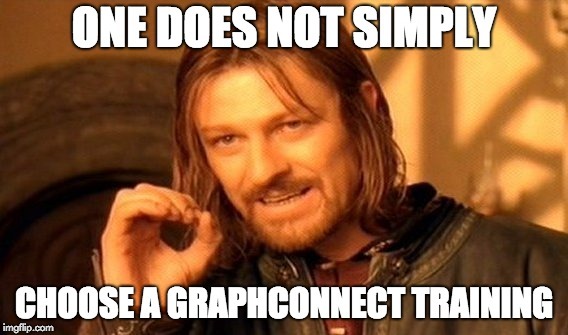 Of course, if you have more questions about Neo4j training at GraphConnect 2018, you can always reach out to the friendly team at graphconnect@neo4j.com. They’ll help you sort out any questions, concerns or last-minute details that require our attention. Click below to register for GraphConnect 2018 on September 20-21, 2018 in Times Square, New York City – and connect with leading graph experts from around the globe.